The castrato Farinelli was a phenomenon; Charles Burney said of him 'In his voice, strength, sweetness and compass; in his style, the tender, the gracious and the rapid'. 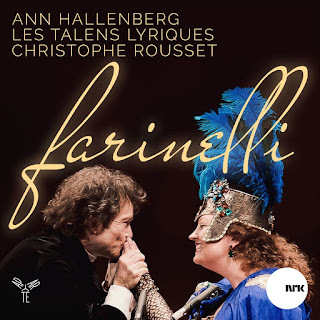 Farinelli - A Portrait from Aparte Music attempts to give us an idea what he sounded like. 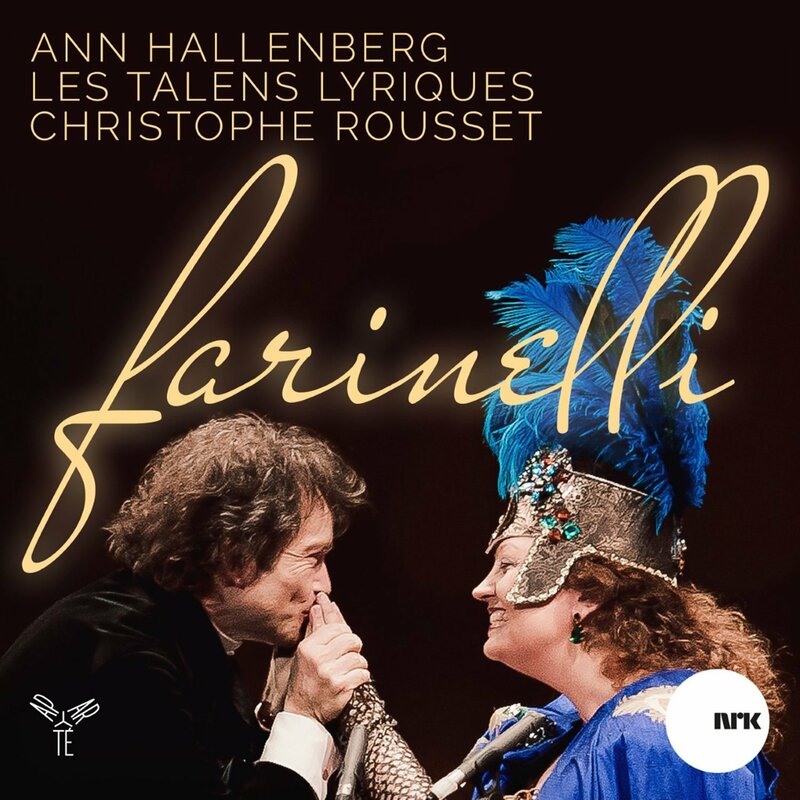 Recorded live at the Bergen International Festival in 2011, it features mezzo-soprano Ann Hallenberg accompanied by Les Talens Lyriques and Christophe Rousset in arias by Riccardo Broschi, Geminiano Giacomelli, Nicola Porpora, Leonardo Leo and Handel. Apart from the Handel (which were included in the concert as encores), all of the arias are from operas premiered by Farinelli, which means the arias were written for him. And in fact Riccardo Broschi was his brother and Nicola Porpora his teacher, so we should presume they had a fair idea of what he was capable. Of course the frustrating thing for modern Baroque lovers is that Farinelli never sang any Handel. The two never worked together and the only time Farinelli sang in a Handel opera, for the Opera of the Nobility in London, he used his own arias. Hallenberg starts of with 'Son qual nave ch'agitata' from Riccardo Broschi's Artaserse which Farinelli made his UK debut with in London to thrilling effect. Opening with a stunning messa di voce (gradual swelling and diminution) the audience was so impressed it applauded for five minutes before he could go on. Quite what he was capable of is displayed by Broschi's outrageously ornamented aria, and here we start to appreciate Hallenberg's rock solid technique so that she make the aria real bravura fun. Even the slower aria by Broschi, 'Ombra fedele anch'io' is full of notes, Farinelli did not seem to do simple. Handel famously had tussles with his singers about the music he wrote for them, but Handel was as strong character and got his way. If he thought it appropriate, his soloists sang something simple (such as Ruggero's 'Verdi prati' from Alcina). Clearly no-one did that for Farinelli. When the composer Quantz, heard Farinelli in Milan in 1726 he lauded Farinelli's purity of tone and his wide range from a below middle C to the soprano top D, some two and a half octaves (certainly not a given with castrati, Senesino's voice had quite a narrow compass) plus the clarity of his trill and the inventiveness of his musical imagination. The two Giacomelli arias are striking, both from Adriano in Siria which Farinelli sang in Venice in 1733; though we can detect a greater directness in the music, the vocal line is still full of twiddles. Giacomelli is little known today but was highly regarded in his day and certainly seems worth reviving. 'Si pietoso il tuo labro' from Porpora's Semiramide riconosciuta is a typical Farinelli slow number, plaintive and attractive with a profusion of spectacular divisions. The opera was premiered in Venice in 1729 during a season when Farinelli first made his major mark in Italy. In fact, 'Alto Giove' from Porpora's Polifemo (premiered in London 1735) is one of the most striking arias on the disc, at times almost accompanied recitative. We don't hear anything of Hallenberg in Hasse (another of the big names of early 18th century opera) but we do get his striking overture to Cleofide, making it clear that we definitely ought to be hearing more from this composer. Leonardo Leo's Catone in Utica was also in that 1729 Venice season, and we get a pair of arias, the first dramatic and vivid, the second rather martial. In fact this aria was written for another Leo opera which Farinelli had premiered the previous year and the young castrato, interested in showing off, insisted that the showy aria replace the one originally written. The two arias by Handel, 'Sta nell'ircana' from Alcina and 'Lascia chi'io pianga' from Rinaldo, take us into a different expressive realm where display and virtuosity are balanced by character and emotion. The disc finishes with a final astonishing aria, again from Porpora's Semiramide riconosciuta. And it is astonishment which Hallenberg provokes in her performance, she manage to combine incredible control with beauty of tone and expressivity, so that she and Les Talens Lyriques really do bring the music alive. We might never know exactly what Farinelli sounded like but this comes pretty close I suspect.